A 'client' template is a backend template that installs as an admin template but displays a simpler interface intended to be used by nontechnical staff who maintain the website and its content. This version reuses much of the Isis template as a foundation but is designed to visually resemble Mission Control. Having been rebuilt and designed as a client template, it installs as a very clean backend template with the expectation that features will be added only if they are needed by the client. Beta version is now available for download. Sign up to be notified when the "production" version is available. Client 3 is the first ever backend template designed exclusively for the client’s user experience in managing the website. (Built for Joomla 3.x.) The traditional admin template installs with full access to all backend features and requires some CMS expertise to use. In contrast, this client template installs practically blank, requiring the site integrator to add which tasks and features will be available to any given user based upon that user’s group membership. As shown here, Client 3 displays no menu or set of quick links. The only universal features are a link to the dashboard, a link to view the front-end of the site, and link to the user’s account for logging out. By default, the traditional admin menu is shown, but only to Super user, and this option can be turned off. 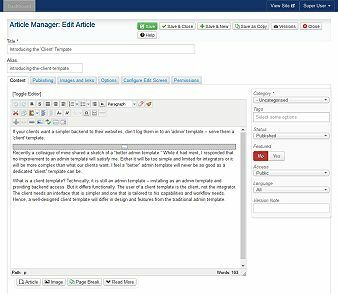 To make the Client Template usable to client and content managers, the site integrator needs to declare one or more sets of links. These can be displayed as a modules of quick links, as a client menu, or both. Client 3 does not come installed with navigation tools, but it does provide links to such tools as developed by the iCue Project, which have been built for and tested within Client 3. This tool allows you to create sets of links, each grouped by a category. An installable admin module allows you to display each set of links and assign the module to display only to a specified access level. Each link includes a title, an icon, and the link to a backend URL that takes a user directly to a starting point for performing a particular task. This accommodates a role-based approach to presenting only certain links to certain groups of users. Details on how to use this tool can be found on the product page for this tool. In many cases, a set of client links will suffice for many client-based users. Arguably, these can replace the need for a dropdown menu. We feel it is a best not to give a client access to the same admin menu that site integrators use. If a top menu is desired for client use, this tool allows you to tailor a main menu to the needs and restricted responsibilities of clients (based upon access levels and/or user groups). 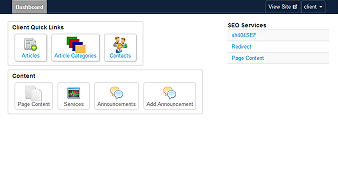 Similar to Client Links, Client Menu allows you to declare a title and a URL to backend pages. In its current state, the Client Menu used drag-and-drop to arrange the menu items and to group them into a hierarchy. Information on how to use this tool is provided on its product page. In the spirit of not dictating how you use Client 3, this client template allows you to include the default admin menu into one of the top two navigation rows. (By default, this menu displays to Super Admin alone.) 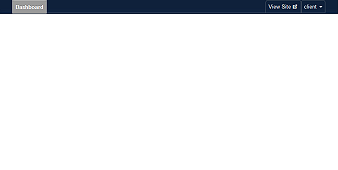 Keep in mind that this menu is not configurable except by overriding at the code level, contains Joomla-specific terms, and possibly offers access to feature that you don’t’ want to show. 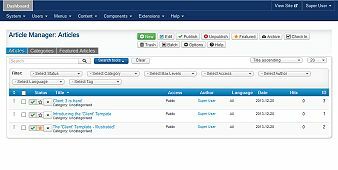 Client 3 leverages many features from Joomla’s admin template Isis – such as drag-and-drop and Bootstrap. However, the layout resembles that of the lean admin template Mission Control (for Joomla 2.5 only). All items found in Isis’s sidebar are moved to the top to provide a wider table for holding more columns. Component section links are clearly shown as such, and filters are clearly marked and grouped just above the list. As a result, all parts are intuitive in what they do and how they are related – requiring minimal user training. The details page varies in a few ways from the Isis to accommodate infrequent users. The action buttons of Save, Close, etc., are moved to the upper right so they demand less attention of the user when starting to edit a page. When fields are grouped under sections, the section links are visually emphasized as tabs. 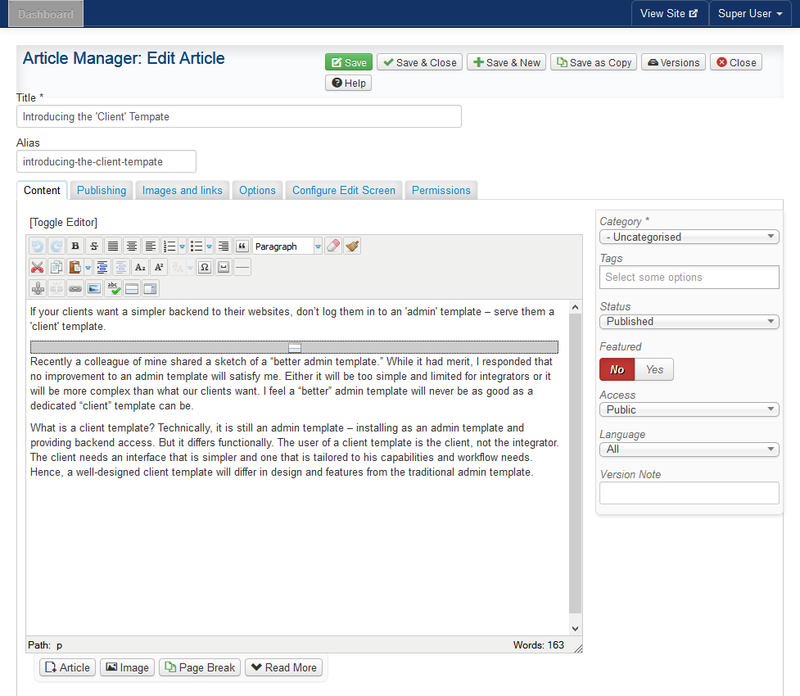 The editor’s extend buttons are grouped with the editor emphasizing their link to the edit field. 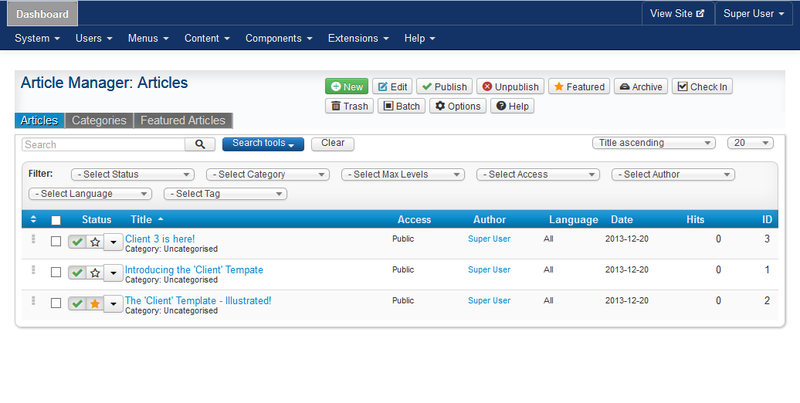 The main options like “published,” “featured,” and “tags” are grouped in a bit more prominently as a sidebar module.